Working with an apprentice has been very satisfying AND very challenging. I knew that working with someone in my studio would challenge me because, ever since I was in art school, I was most creative in solitude. What I didn’t expect was that with the right person, I actually look forward to and enjoy working alongside someone. I didn’t expect the enrichment of experience I am having as I work together with an apprentice. In an ironic twist, maybe, I’m learning so much! But maybe teachers all over harbor this concept as to not distract from the learning that happens in front of them. Teaching and sharing ARE learning! It’s a kind of closed loop. Maybe this sounds paradoxical, but if you’ve ever taught someone or shared something that you love with someone, you have felt the satisfaction of knowing that we are just agents that pass on knowledge/truth and are “just” a kind of custodian while we carry it and pass it on. Questioning, seeking, and hopefully answering. Enjoy. If you have questions or comments, leave a comment, below. ;-) I would love to answer them! Opening the bottom with a ball opener/bottom maker. Here I open the bottom of the pot with ball opener in my left hand and sponge in my right hand. I forgot to take off my geeky wireless headphones for the photo shoot!?#@! I am measuring the bottom section to match it to the previously thrown cap. I usually throw the cap ever so slightly smaller than the bottom section. Here I am adding the "cap" that I actually made before I threw the bottom section. I measured the cap before I took it off the wheel with my calipers, then set it aside. The cap is slightly smaller than the bottom section. One advantage to capping is that the clay is still wet and can still be stretched and thrown. The other advantage is that the torque in the clay, or the throwing lines are in the same direction in both sections. The two sections are "welded" together. With my left(inside) hand I move at the same time as the right (outside) hand and in the opposite direction. Then I make the opposite move with the weld. This "cancels out" the marks so that when the pot is turned you don't get caught in the ruts of any makes you have made. The section is ribbed and thrown. After the sections are thrown together and consistent, the rim is measured for the next cap. A new cap is thrown. The cap has no bottom and the ball opener rides on the wheel head. Measuring the cap. Throw the cap wider at the base then you think you may need. Its always easier to narrow than widen. When I cut the cap off, and set aside I always make the table wet so the cap doesn't stick to the table when I need to lift and put into place later. The cap is set in place. I really don't score the sections, but I make sure that the section below is scraped of slurry. The second cap is thrown into place and the rim is set. 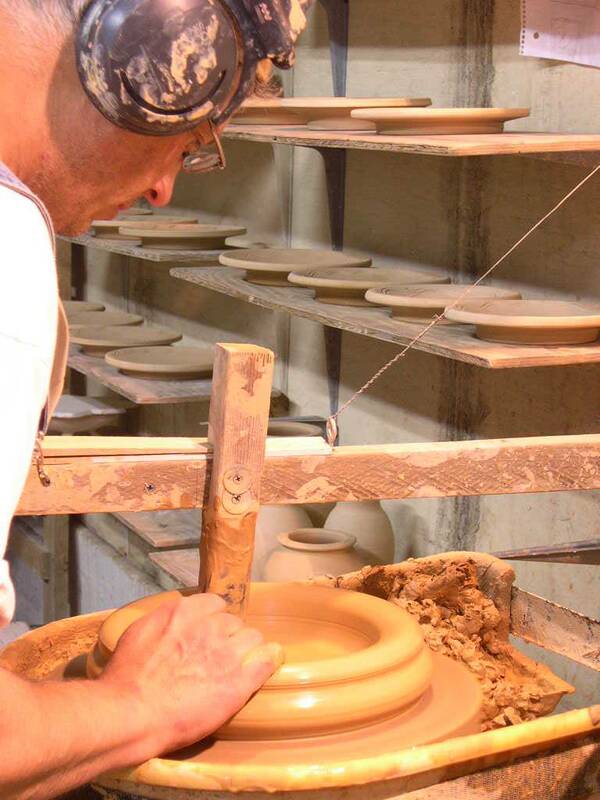 The whole pot is ribbed and thrown into shape. At some point I rib from the inside only , but I find that the "line" of the pot looks stronger if you can thrown the shape in rather than just ribbing it. I didn't photograph the 5 inch stand that I have to get up on while doing these final reaches for the bottom. Also either roll your sleeves up or wear a cut off shirt and mind your apron. These can snag your pot and ruin it. Here we see our geeky potter hamming it up after the work is done. Handles will go on the jar in the morning. There’s nothing like travel to open my eyes to what is possible and there’s nothing quite like 10 days in California to present an alternative to home. I just returned from a workshop tour in the Bay area and have so much goodness to rememeber and reflect on. Traveling gives me a particular point of view that I think is essential to understanding the world “out there” and as well as understanding what I call home. It is a contrast and a comparison of what is familiar with what is new. In a parallel way, teaching gives me perspective. Sharing what I know and do with my workshop students, challenges and reaffirms what I believe. Teaching expands my understanding and often I find myself the student in a funny twist. Maybe you would agree? For now I will write in a general way because my goal, today, was to send my gratitude out to all of the folks that I met along the way. Gratitude to all the folks who took care of me, and supported me. To all the folks that laughed with me. Although for most of the time it rained, there were many rainbows. I really love to write. I do! For several years I stretched my mind and crafted words to express and translate what was in my head and what was happening in the studio. are you tired of algorithms? Do you have time to read something longer than a caption? Maybe Instagram and Facebook are enough? I will try to write at least once a week about what I’m thinking about and doing in the studio and beyond. a fresh start. Please let me know what you think in a comment below. The adventure of fire continues tonight while during the 23rd firing of my gas kiln a mug fell from the fire wall into the fire box right in front of the burner. I apologize for the pottery jargon. Let me briefly explain. The fire wall, aka, “bag wall” is a short wall of bricks that separate the stacks of pots from the “fire box”. The firebox is an area where the fuel is combusting, whether it be wood, or gas. OK, so I decided to try to extract the pot by the handle and had to reheat the mug so it would release from it’s newly bonded surface of the kiln floor. You see, the kiln and the pots at 2400°F are sticky because of the soda glaze that coats everything in its path. I wasn’t able to move the mug because the firing was over and the molten union of mug and firebox floor had already solidified. So I reignited that burner and slowly, carefully reheated the mug. After about 10 minutes, the pot was glowing red (again) and I was able to pry it off the floor. Wow, I was super excited that it seemed to be in one piece despite its fall to the floor from about 15”. 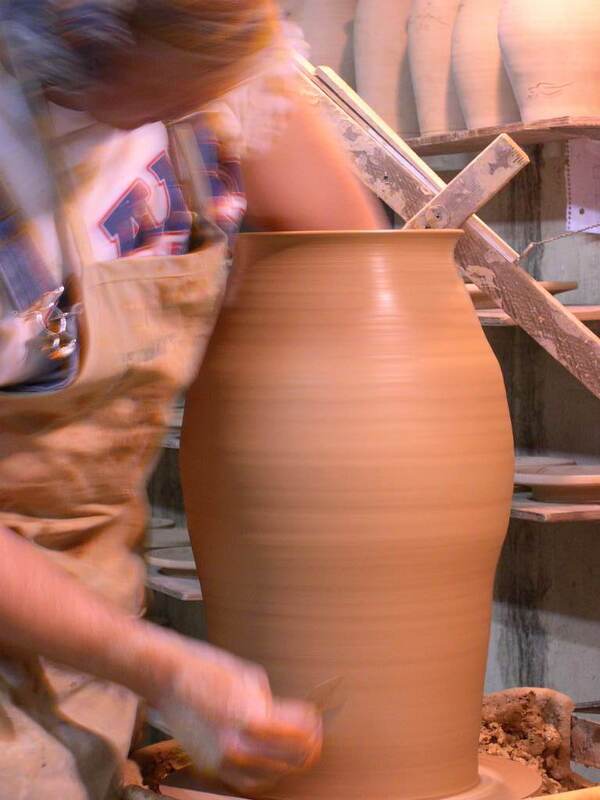 When ceramics is fired and at a temp of 2300-2400 degrees, its in a state known as pyroplasticity. I suppose the mug was more like a rubber ball than the dense ceramic object we all know after a pot has cooled. I can’t think of a better way to describe my theory. I covered the hot mug with more leaves and a clay sagger. It smoked quite a bit and then I heard a loud crack and thought to myself that the mug must’ve just popped, being in a thermal “shock”. I couldn’t wait to see the mug even though it might be ruined, there was no turning back. But, by some kind of ceramic miracle, it came out fine, with just a couple of rough spots from its landing on the floor of the kiln. I'm loading my kiln today, but managed to have Lillian take some video of my brushwork. I think I need another take or two, but for now I thought it would be nice to share this with my readers as an advance rough-cut, and when I am finished firing I will put these together in a more polished version. I will be in Seagrove this coming weekend for the 10th Annual Cousins in Clay. More info on that show can be found here! I hope to see some of you who can make it. These plates were stacked and I was ready to paint some patterns on them but was struck by their borders. 🤔 How important are patterns with edges like this? If you’re familiar with my work, you probably know what I’m about to do, but what would you do? Click the Tales of the Red Clay Rambler graphic below to listen! Here's my friend Cori Sandler using a slip trailer to create a beautiful scrolling raised floral pattern. Enjoy. When it’s raining outside doesn’t everyone slip trail??? Are you a spiral fan or a circle fan??? I can’t decide myself. Amazing floral brushwork by Anastasia Ropalo! Here's an awesome video from Adam Field! See Adam's caption below.